It's been a while since we've experimented with some fun tech tricks, so here: On this lovely Friday, I present to you eight emoji hacks you need to know, for the simple reason that there's so much more to life than a yellow smiley or a pair of praise hands. Emoji were originally intended to spice up your text conversations; since they've become so commonplace, however, they seem a little less creative now than they once did. That's where these hacks come in — they'll change up your emoji game for the better. Think of them as Emoji for the Advanced Texter: The 200 level course, as opposed to Emoji 101. I'm using the word hack a little loosely here, as has become the custom; many of them are more like tips and tricks, rather than actual hacks, although some of them do require a little dedication to carry off. If you have an Android, you also may need to root your phone — that is, give yourself root permissions, which Lifehacker describes as being similar to running a program as an administrator in Windows. Rooting allows you access to certain system settings, which in turn lets you tinker around with things a bit (although I would stay away from rooting if you're not well-versed in tech — it could go wrong, and then you'd be kind of screwed). 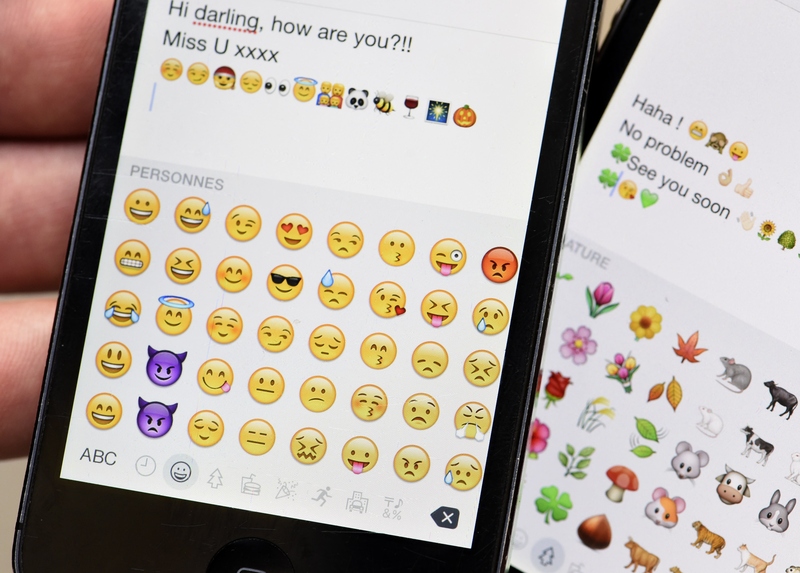 In any event, though, these eight little hacks will boost your emoji game way, way up. Have fun! We went over this trick back when we talked about the many ways you can get “shruggie,” aka the shrug emoticon, into your life, but just in case you need a reminder, you can actually set your phone to autocorrect a certain word or phrase into an emoji. On an iPhone, copy your favorite emoji from the emoji keyboard, then go to “Settings,” then “General,” then “Keyboard,” then “Shortcut.” Take the plus sign in the upper right hand corner to add a new shortcut; then, when the “Add” menu pops up, type the word you want to autocorrect into the emoji into the “phrase” field and paste the emoji into the “Shortcut” field. Hit save, and voilà — whenever you type that phrase, it will autocorrect into that emoji. Or Google ones, or LG ones. I suppose technically this one isn't really a “hack” — or rather, it is one, but someone else did most of the hard work for us. Basically, all you need to do is download the app Emoji Switcher onto your Android phone, and you can swap out the emoji that are native to your device for those belonging to any of the aforementioned ones. Your phone will have to be rooted for the app to work, but still — pretty neat, no? Watch it in action up top. Snapguide has the detailed instructions for this one, complete with screenshots, but the short version is this: On an iPhone, first press and hold your home screen icons until they shake; drag them into each other to sort them into folders; and then touch the folder name to rename the app grouping. Instead of typing in a term like “Photo Apps,” use the emoji keyboard and select, say, the camera emoji instead. Voilà! A home screen organized entirely by emoji, rather than by words. Fun fact: You can set your phone such that it will speak the full name of any emoji you select — names which, like those belonging to stock photos, are often bizarrely and hilariously specific. This might just be an iPhone trick, so if you have an Android or are Windows phone… uh, sorry. For the Apple users out there, though, this trick is pretty neat: Go to “Settings” > “General,” then scroll all the way down to “Accessibility.” Tap “Speak Selection” and toggle it to “On”. Then the next time you want to use an emoji, tap it in the entry field after you've selected it, highlight it, then choose the “Speak” option in the menu that pops up. Your phone will tell you exactly what the emoji is (something like “a monkey that can hear no evil”). The “Reversed Hand with Middle Finger Extended” emoji was approved by the Unicode Consortium in 2014 as part of the Unicode 7 update; however — and perhaps predictably — most of the official emoji keyboards don't actually have it yet. (Remember that whole thing about how Unicode decides what emoji exist, but each platform is responsible for designing the way the individual emoji look on their devices or programs? That's what we have going on here.) But! If you really, really can't live in a world where there is no Flipping the Bird emoji, good news: GetEmoji made a mockup of it — and you actually can text it. All you need to do is go to this page in your phone's browser, press and hold the middle finger emoji mockup, and select “Save.” It'll then appear in your camera roll—and from there, you can either view the image, select it, copy it, and paste it directly into your SMS field, or you can use the “create a shortcut for emoji characters” trick up top to set a specific phrase to autocorrect to the emoji. Related: WhatsApp for Android appears to have the middle finger emoji hidden deep within its texty depths, and Windows 10 shipped with the middle finger emoji built into it. This is another one we've already been over, but it's too good not to include again: Thanks to a little trickery, you can add the Vulcan salute from Star Trek on iOS 8.3. Heck. And yes. Side note: Seriously, go take a nap at work today. You'll be so much more productive. Like Gchat, Skype has a whole lot of secret emoji that you can manually access by typing in the right things. My favorite as demonstrated by the video seen here? The drunk emoji. Because we've all been there.